After months of structural design considerations, a workshop to prepare the site and another to lay the foundation and abutments, a determined group of wallers made the dry stone arched pony (foot) bridge a reality! 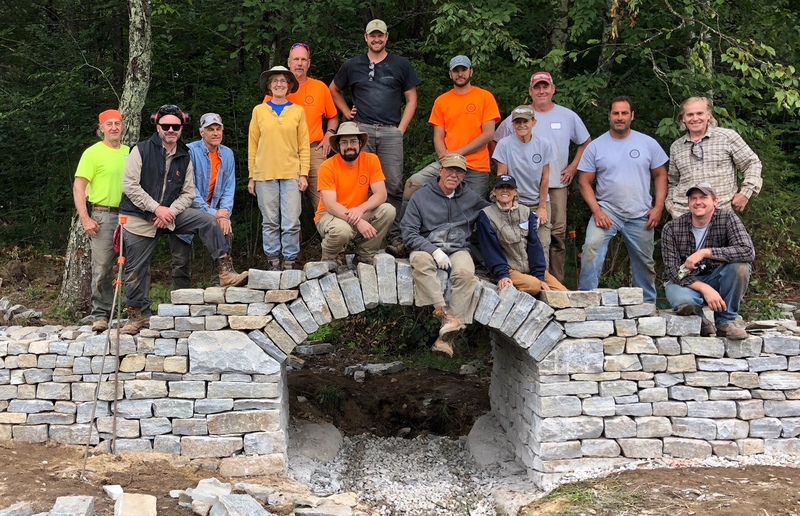 On Sept. 8th and 9th, under the guidance of two DSWA-GB Master Craftsman and Certified Instructors – Dan Snow and Brian Post, along with Coordinator & Certified Instructor, Pete Ryder, the workshop participants spent two days building the arch and completing the main portion of the bridge. The bridge has a 5′-6″ arch span, with a 7 foot width across the the barrel vault. Participants for this workshop came from 2 countries and 4 states to learn bridge building. Special thanks to our volunteers: Jordan Keyes from Trow & Holden, Andras Lazar and Alex Hoffmeier. Congratulations to everyone involved in the project!